You are here: Home › News › Riverside • Wanna be a Tiger? Riverside University High School – RUHS – is serious about living up to the “U” in its name. Riverside Principal Dan Donder expects the 2012 graduating class to be on a par with those of the last several years. This year’s exact numbers aren’t known yet. But in June 2011, of the 373 seniors who started the school year the previous fall, 370 graduated. And, roughly 86% of those progressed to the “U”niversity level. The students who will graduate this coming June 9 at the US Cellular Arena will mirror last year’s successes, Donder says. “I think these numbers might shock a lot of people who, unfortunately, have a fairly negative view of MPS in general,” Donder said. He explained Riverside is near or at the top for both MPS and even statewide for both graduation rates and percentage of students advancing to the university level. The positive statistics don’t stop there. Riverside’s student population of nearly 1,600 is around 85% minority, including African-American, Hispanic and Asian students. Many of the students who go on to college are the first generation in their families to do so. The 2011 graduating class, with help from Riverside’s enthusiastic guidance department, accumulated nearly $3 million in scholarships. “Most people think African-American kids aren’t doing well,” Donder says. “But they do well here.” He cites the number of support systems in place at Riverside to ensure the students are achieving their goals. Riverside also is a large comprehensive high school, Donder says. “Comprehensive means we have a large musical and theater department and good sports programs,” he says. Those non-academic areas draw students initially, but also, the participants know they have to keep up their grades to stay in those programs, Donder says. Donder has been principal at Riverside for six years and these numbers have been fairly consistent over his tenure. He attributes a good deal of the success to starting things out right. “Having the college prep school really forces that conversation,” Donder says. “I, as the principal, start the conversation on freshman orientation night. The parents are sitting there with their little freshmen, anticipating one kind of conversation, but I give them the college acceptance and financial aid conversation,” he says. Why is he talking about this, the parents might be thinking, Donder says. But he notes, “The four years go so fast. Every day counts.” He insists that Riverside students need to be at school and be ready to learn, to ask questions and become advocates for themselves. For parents, in Donder’s view, it’s the same thing. The statistics alone are not what satisfy Donder. He teaches courses at UWM. When he’s walking on campus there, he’ll meet Riverside graduates. “I ask them, ‘Were you prepared for college?’ The answer always is ‘Yes.’” The only weakness that the school has gotten feedback on involves mathematics. So Riverside staff members are working on ways to beef up the school’s offerings in that area. But there’s more at Riverside than just academics. The school’s mascot is the tiger, known for strength and speed, as well as deep familial connections. Those positive characteristics are reflected in a variety of ways at Riverside to encourage school spirit and strong values among students. The administration works hard to convey a range of priorities that affect students’ lives both in and outside of school. Four such assets can be found in the Riverside acronym, RUHS. Riverside students are active in the community outside the school’s walls, too. The “Box City” event, which benefits the homeless, has been a tradition at the school for many years, Donder says. Students raise funds while learning about what life is like for a homeless person in Milwaukee and the challenges that person faces on a daily basis just to stay alive. On the night of the event students are involved in a variety of activities inside the school building, sponsored by agencies such as the Hunger Task Force. 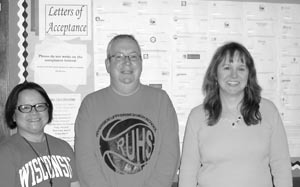 For the most recent Box City event, the Riverside PTO and some of the teachers made crock pots of soup that were distributed throughout the building. Announcements were made periodically as to the location of the soup pots. If students arrived at the locations and the soup was gone, they simply had to deal with it. Outside, the participating students built shelters out of huge cardboard boxes to sleep in, regardless of the weather. By taking pledges for Habitat for Humanity for their participation in the event, Riverside students raised $60,000 over the last 10 or 12 years, Principal Donder says. “Last year, we went to the Habitat folks and they were very excited,” Donder says. Through networking, someone in the community learned about the students’ achievement, thought it was “so cool,” and matched it, Donder says. As a result, not one but two new houses were built in Milwaukee in 2011 by Habitat for Humanity, with Riverside students helping on the crews. That allowed two families to move out of homelessness and into safe, new homes. And, twice a year, the Blood Center of Wisconsin holds a blood drive at Riverside. Donder is proud to relate that the Riverside drive is one of the biggest in the city. When asked what neighbors could do to help support Riverside, Donder has a number of suggestions. “They could come visit the school, see what we’re all about, and encourage their neighborhood kids to come to our school.” Whether it’s sports, plays or concerts, there’s a broad array of opportunities for Riverside’s neighbors to show their Tiger spirit. Check out the school’s website at www2.milwaukee.k12.wi.us/riverside for information about upcoming events including the Annual Rummage Sale and Flea Market May 12, the Spring Band and Orchestra Concert May 17 and the “Swing into Spring” Jazz Concert on May 24.